Female Phloeosinus dentatus, copyright N. Wright. Contains: Xyloterini, Micracini, Bothrosternini, Scolytus, Diamerini, Scolytodes, Phloeotribus, Hylurgops, Tomicini, Polygraphini, Crypturgini, Pityophthorina, Corthylina, Cryphalus, Xyloctonini, Hypoborini, Ips, Hypothenemus, Scolytogenes, Cyrtogenius, Xyleborus. 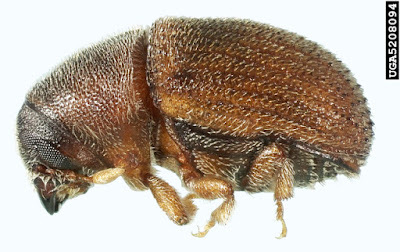 The Scolytinae, bark beetles, are a group of small weevils that live and feed in the subcortical tissues of plants. They are characterised by a reduced rostrum, geniculate antennae with a distinct, compact club, and tibiae marginally armed by spines or socketed denticles (Wood 1986). The majority of species live in galleries in the phloem layer of their hosts but some feed on other tissues such as xylem or seeds. Some species feed on ambrosia fungi growing on host xylem. Many bark beetles are monogamous with a single mating pair living in a gallery; eggs are laid within the gallery and the parents guard the burrow entrance while the larvae develop. Other species exhibit various modes of polygyny. Wood (1986) recognised the Scolytidae as a separate family from the Curculionidae, divided between two subfamilies Scolytinae and Hylesininae on the basis of features such as form of the pronotum and base of the elytra, but more recent studies have not supported monophyly of the latter two groups. Tribes of the Scolytinae include the Scolytini, members of which are most diverse in the Americas and lack armature on the lateral margins of the pro- and metatibiae except for a single, apical, spinelike process curving towards and extending beyond the process of the inner apical angle (Wood 1986). Characters (from Wood 1986, as Scolytidae): Adult with head narrower than pronotum; eyes nearly flat against head, often emarginate to divided; pregular sutures present and reinforced internally by massive apodemal ridges; rostrum short to nonexistent; hypostomal area small, posterior mandibular condyle more anterior in position; axis of mandibular hinge oblique to transverse, cutting edge on mesal margin; pronotum often asperate, almost never with constriction near middle; when visible, scutellum usually flush with elytral surface, often flattened; metepisternum stout to elongate, anterior margin usually procurved, anteroventral angle displaced slightly caudad and distinctly extended ventrad; mesepimeron flat, oblique; mesepisternum smaller, declivous cephalad; tibiae armed on apical and/or lateral margins either by spines or socketed denticles, apical mucro formed by mesal element; tarsal segment 1 about equal in length to 2 or 3; male spiculum gastrale present. Larva with clypeus distinct, separate from frons; frontal sutures never reaching articulating membrane of mandibles. [B38] Blackman, M. W. 1938. 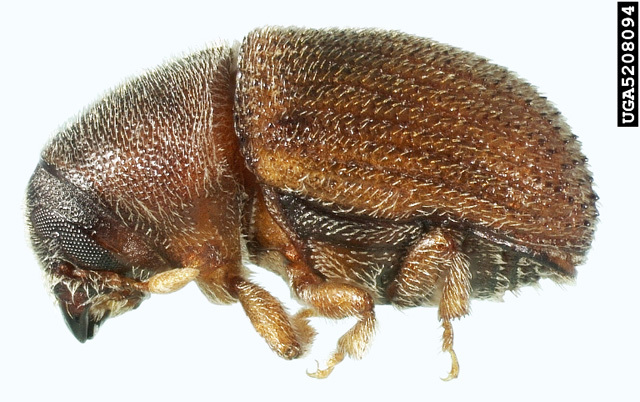 New species of Cactopinus Schwarz (Coleoptera: Scolytidae). Proceedings of the Entomological Society of Washington 40 (6): 151–157. [JKW03] Jacobs, K., T. Kirisits & M. J. Wingfield. 2003. Taxonomic re-evaluation of three related species of Graphium, based on morphology, ecology and phylogeny. Mycologia 95 (4): 714–727. [L86] Lindquist, E. E. 1986. The world genera of Tarsonemidae (Acari: Heterostigmata): a morphological, phylogenetic, and systematic revision, with a reclassification of family-group taxa in the Heterostigmata. Memoirs of the Entomological Society of Canada 118 (S136): 1–517. [RW02] Reay, S. D., & P. J. Walsh. 2002. Relative attractiveness of some volatiles to the introduced pine bark beetles, Hylastes ater and Hylurgus ligniperda (Curculionidae: Scolytinae). 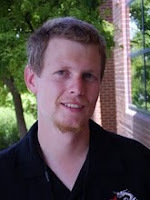 New Zealand Entomologist 25: 51–56. Last updated: 19 September 2018.